With Thanksgiving being so late this year, Advent is right around the corner - 10 days from today to be exact! I love the season of Advent and preparing to celebrate the birth of Jesus. The month of December is typically a busy season full of parties, get-togethers with friends and family, travel, etc., but I relish the chance to take time to remember the why of the season for the 24 days leading up to Christmas. To me, the story of Jesus is the most important story of all time, so it's worth setting aside time to look at it more closely. 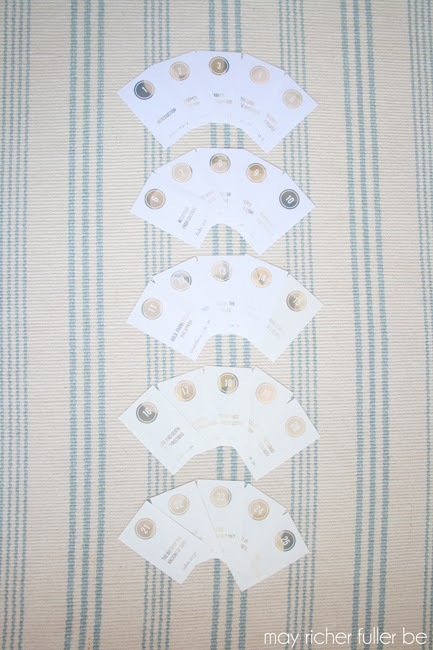 To do that, I designed a set of simple gold and white note cards that function as an Advent calendar. There are 25 cards in all. 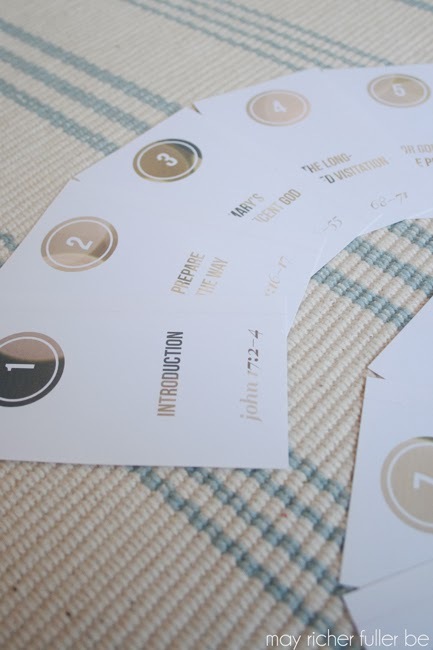 Each card has a title and a scripture passage that corresponds to a short reading (two pages) from John Piper's "Good News of Great Joy" free PDF book that walks through the story of Advent and why the story of Jesus is so important. My set of cards corresponds to the 2012 version, but the 2013 version is out now as well if you happen to have used the 2012 version last year - just know that it doesn't match the references on my set of note cards! I'd love for this set of note cards to go out to as many people as possible this year, so I'm offering them as a free download so y'all can print them at home. 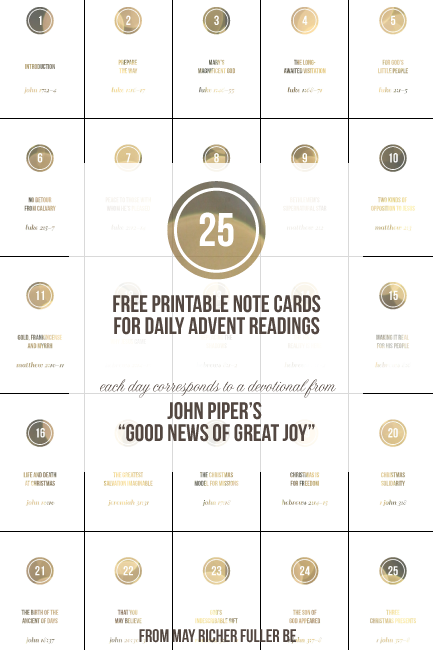 Use them with your family if you'd like, and give a few sets away as gifts with a the link to John Piper's book. Wrap a pretty ribbon around them and hand them out to friends and family. It's an inexpensive but meaningful gift that they can use during this Advent season. The calendar is designed to print to 3x5 note cards. To print, download the PDF file here (or click the image below), open it, and hit the print button. Choose 3x5 card as the print size (mine had that option as a default, so I'm assuming most printers do too! ), put 25 blank 3x5 cards in the printer tray and click print. If you have any issues, let me know and I'll be happy to help you troubleshoot. I hope that you enjoy this Advent calendar. Join me in preparing for this season of joy! 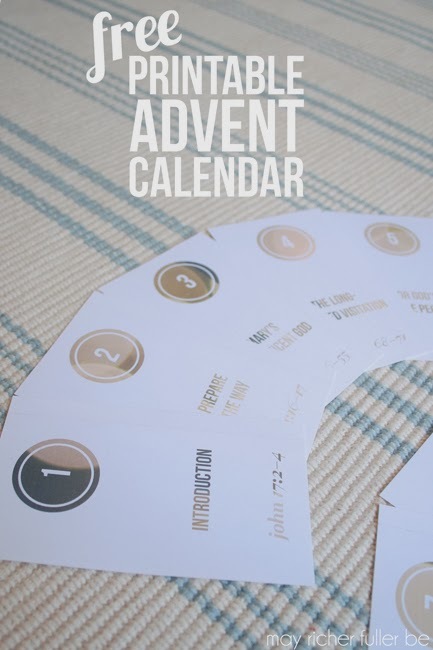 I'll be back tomorrow with a round-up of my favorite Advent calendars from around the web - there are so many pretty ones out there this year! Do you have any Advent traditions? What are you most excited about for this upcoming season? I love finding ways to focus on Jesus during Christmas and this is a great resource! Thank you so much for sharing this! Pinning! We haven't done any Advent events but this would be a great start! Chaney, This is awesome! Somehow I missed this post the first time, but saw it on the Handmade Home and clicked over. I love your post and your printables are gorgeous. Will definitely be sharing. قم بإزالة كيس الكنس مباشرة عقب الاستعمال وتخلص من محتوياته في كيس بلاستيكي مُحكم الغلق.